The galaxy just called for help. Unfortunately, the wrong man answered. When small-time conman, Cal Carver, is thrown in jail and forced to share a cell with a semi-naked cannibalistic serial killer, he's pretty sure his day can't get any worse. It isn't until two-thirds of the human race is wiped out and Cal is mistakenly abducted by aliens that things really start to go downhill. Whisked across the galaxy, Cal is forced into a team of some of the sector's most notorious villains and scumbags and tasked with delivering a package to a warlord-run solar system where the authorities daren't venture. The mission should be simple enough, but as one screw-up leads to another the ragtag group of unwitting heroes find themselves in a frantic battle to save an entire alien civilization - and its god - from total annihilation. Featuring epic space battles, hilariously snarky characters, and a shapeshifting blob with the face of Tobey Maguire, Space Team is the first book in the internationally bestselling series by award-winning author, Barry J. Hutchison. *Except Samsung's Galaxy S series, which is a range of mobile devices, and so not really similar. You don't really want to stick around on Earth, do you? Have you seen the state of the place? 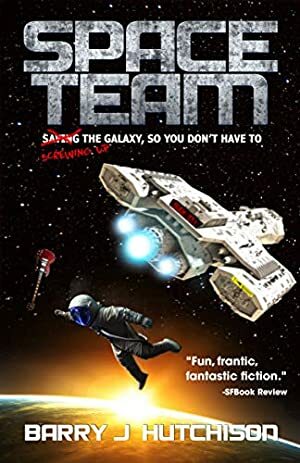 Buy Space Team now, or read FREE on Kindle Unlimited, and blast off on an action-packed adventure that'll have you laughing your puny human head off. "Thrill a minute space adventure." "Laughed so hard I shot coffee out my nose." "If Douglas Adams wrote the A-Team, Space Team would be the result." "If all scifi was like this, everyone would be reading it." "Relentessly funny scifi comedy adventure." "Someone call Netflix - they've got a new show to make!" "I rarely give out five-star reviews for books - generally save those for life-changing reads - but I think Space Team, for what it aims to be, deserves the highest praise I can deliver. Well-written and expertly paced, it held my attention from cover to cover." "I cannot remember the last time a book made me literally laugh out loud. Not a low "haha" to yourself, not a big smile as you turn the page, LAUGH out LOUD. As in, having to stop and put it down to wipe your eyes. Having to remember to bite your lip so the people around you don't think you're undermedicated." Log In to track Barry J. Hutchison on eReaderIQ. to be notified each time the price drops on any book by Barry J. Hutchison. to stop tracking Barry J. Hutchison. We started tracking this book on September 14, 2016. The price of this book has changed 32 times in the past 950 days. The lowest price to date was FREE last reached on February 10, 2019. The highest price to date was $2.99 last reached on December 28, 2018. This book has been $2.99 10 times since we started tracking it.